Growing up I hated tomato soup — like wouldn’t touch it with my spoon tied to a 10-foot pole, hated it. Believe me, my dad tried on numerous occasions to serve it for lunch. I was always a “good eater,” but it was one of the few foods that I steadfastly refused to eat. Fast forward about 20 years to a random lunch with my hubby at First Watch. I decided to take a little taste of his cup of tomato basil soup, and I had a revelation… It’s never been tomato soup itself that I hated! It’s that icky canned condensed blob of tomato-like substance that my dad always tried to serve that I despised. So as with so many of my other favorite restaurant recipes, I set out to recreate that lovely creamy tomato basil soup at home. I like to think this recipe comes pretty darn close! 1| It starts with canned tomatoes. Surprised? I like fresh tomatoes as much as the next person, but using canned whole tomatoes gives you more consistency in flavor from batch to batch, while also making this a super easy and convenient recipe to prepare year round. Plus canned veggies actually rival fresh veggies when it comes to nutrients because they’re harvested and packed at the peak of ripeness and freshness! 2| The addition of tomato paste gives more depth of flavor. Adding a couple of tablespoons of tomato paste really intensifies the tomato-y taste of this soup, especially when you add it at the end of sautéing the aromatics. 3| Fresh basil adds brightness. But if basil isn’t your thing, feel free to switch it up. Rosemary, thyme, parsley, and chives are also fabulous choices. It’s a great way to use up whatever you have on hand! 4| There’s just enough cream. Using just 1/2 cup of heavy cream is enough to add richness to the soup without adding a ton of extra calories. I think it’s the best of both worlds! Sometimes I’ll swap it for crème fraîche for a change of pace. You seriously won’t believe just how easy it is to prepare. It really doesn’t take much longer than heating up the canned stuff, and I promise you it tastes a gazillion times better! Just 10 minutes of simmering after sautéing the onion and garlic, puree, and serve — preferably with a hot and melty grilled cheese sandwich on the side. PIN IT NOW! CLICK HERE TO ADD THIS CREAMY TOMATO BASIL SOUP RECIPE TO YOUR EASY RECIPES BOARD ON PINTEREST! I’m not big on having a multitude of kitchen gadgets, but one that I can’t live without is this immersion blender. It makes pureeing hot soups, like this tomato basil soup, a total cinch, and it cleans up like a dream. If you’re looking for a more budget-friendly option, I’ve heard this Cuisinart model is very good, as well. If you don’t have an immersion blender, you can always drag out your blender or food processor. Please, please, PLEASE, just make sure to puree in small batches with plenty of headspace. Hot liquids expand, and I’m hoping to save you all from spending hours cleaning tomato soup off of your walls, cabinets, ceiling, and every other possible kitchen surface — a lesson I learned the hard way as a newlywed. 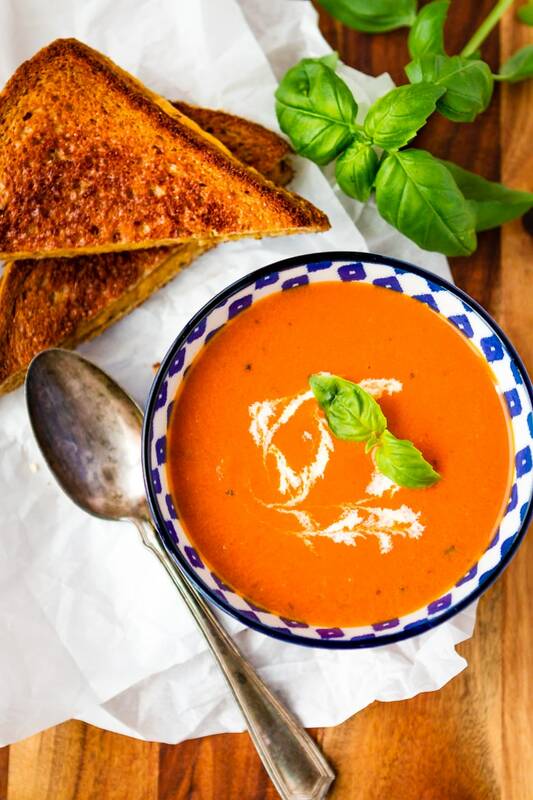 I’d love to see how your creamy tomato basil soup turns out… Tag me @Unsophisticook on Instagram or use the hashtag #Unsophisticook so I can check it out. Enjoy! Just found this recipe. Do you think one could pressure-can this? I LOVE my grandma’s recipe for home-canned tomato soup concentrate (have to admit, this is what I grew up on, so I never had the experience of eating from-a-tin-can tomato soup…but it looks disgusting). I’m just looking for something else to try. Hi Sarah! I’m not an expert in writing recipes for pressure canning — there’s a lot of science that goes into them to prevent spoilage. My first inclination is to say no, though. I know from canning tomatoes previously that they need an acid, like lemon juice, to preserve them. Freezing it works great though! I just recommend freezing it without the cream and stirring it in when you reheat it. 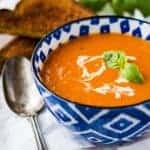 We love tomato soup and this looks fantastic! Just made this soup!….I’m a terrible cook and it turned out perfect and so yummy! REALLY YUMMY SOUP!!!!! MAde it this weekend and can’t stop eating it. LOVE that it is easy and simple. ONLY FIVE STEPS! Glad you liked it, Andrea! 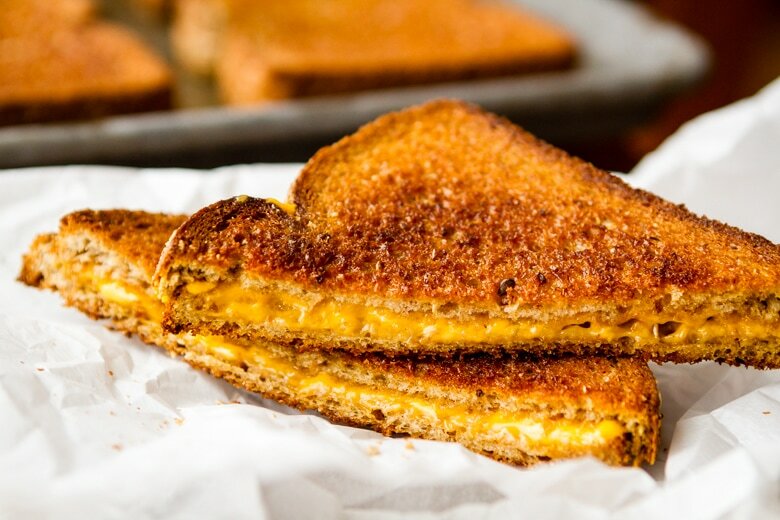 It’s a family fave here too, and I love that it’s an easy meal paired with a gooey grilled cheese sandwich. I hate tomato soup (mostly because of the texture too)! But I’ve only tried the ones from the supermarket so I hope your recipe will change my opinion about this dish. Is this something you could freeze, with the heavy cream in it? I love Tomato Basil Soup, but I’m the only one here that does, so it would be so convient to freeze this in quart size bags! Thanks! I haven’t tried freezing it, Sharon, but the ratio of cream to tomato is low enough that I think it should work. If you find that it’s grainy, you may want to just freeze it without the cream and stir a little in after you reheat it — and it’s actually still pretty delicious without the cream! I make a homemade tomato soup too but with it I make homemade parm. croutons too! Double yummy! This sounds wonderful I have to try it. I did not like tomato soup either growing up but, as I have gotten older my taste buds have changed and this sounds awesome. Thanks for taken the time to share with us.. I appreciate..
My soup kick is in full swing, I could live on it this time of year. Love this! Homemade tomato soup is the best, in fact it is rainy/snowy here today and I was thinking this would be perfect! Oh, I think homemade veggie stock would be a great substitute! I don’t make my own stock nearly enough, and I really should. Also, could you substitute the chicken stock for homemade vegetable stock? Tomato Basil Soup is perfect this time of year, but I’m with you – I detested the thought of it as a child. Now I can’t get enough of it.